Note: Technical difficulties prevented me getting video cut up after the game. This is also the reason that there will be no Three Things this week. A disappointing finale to a weekend double header against the Grizzlies saw a flat Kings side drop their 4th game this season against the Grizzlies, this time by a 4-1 score. For the 2nd weekend in a row, the Kings opened up a double header against an Island Division foe with a big victory on home ice to earn their first points against that team this season. This time, a 5-1 decision over the Victoria Grizzlies for the Kings 1st win in 4 attempts against Victoria, and 5th victory in a row. Both teams had their own setbacks heading into tonight. The Kings were without 5 regulars, with three in Calgary for Canada West Selection Camp, and another 2 on the shelf with injuries. That meant a lot of minutes but also a lot of opportunity for players to step up into roles. I thought that Liam Lawson was a natural fit for Tristan Mullin and Curtis McCarrick, and that trio was very good for their first time out in game action. Hunter Findlater also continued a good stretch for him recently. 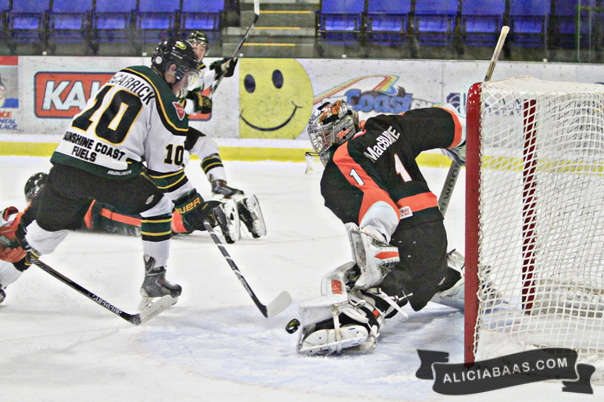 On Findlater…he’s inventing ways not to score in Powell River. How close has he been, particularly against Victoria in both the 2014 playoffs and then again Saturday night. His chance in the 2nd period where he deked out the goalie only to be stopped on the goal line is as close as they come. Back to the setbacks. 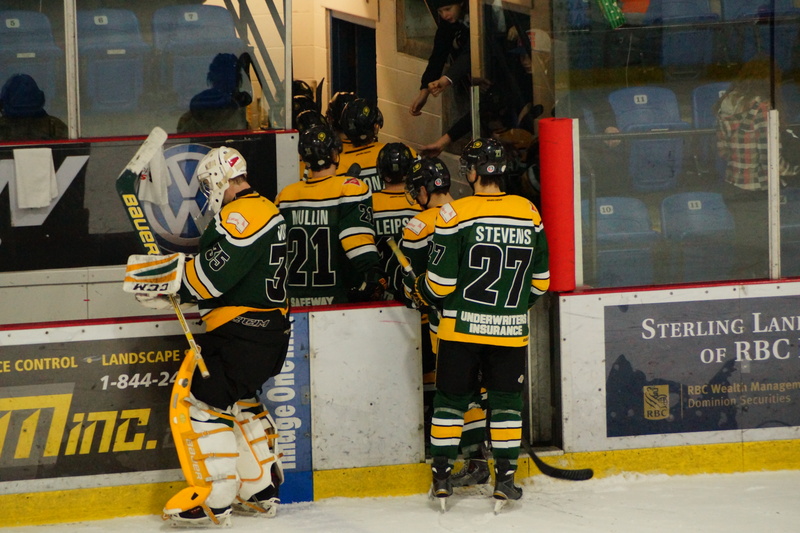 While Powell River were shorthanded, Victoria were short prepped. A winter storm meaning ferry cancellations between Vancouver Island and Powell River sent Victoria the long way and turning a 4-5 hour travel day into a 12-13 hour one. Their arrival was delayed further by an over turned car south of Powell River which backed up traffic off the boat. They arrived at around 6:10 and were on the ice for warmup at 6:50. Did that impact the game? Probably a bit, how could it not, but it’s situations that crop up from time to time in this league which travel is certainly unique to perhaps any other league at this level. The first, and I’m not sure what I saw that Brock and Tristan didn’t (see below) but I thought it was a pretty messy opening 20. Perhaps my expectations were too high going into 20 and I thought the Kings would blow Victoria out of the water considering the long travel day. Brock conceded a slow 5-10 minutes, but better as the game went on. Certainly the 2nd period with the early goal was more what my expectations were through 20. Regardless a 1-0 lead you take any day. Into the 2nd and the Kings tightened the noose with a quick start and some insurance, but look at the Kings goals tonight. Lawson, a point shot and a redirect that I didn’t really appreciate at the time but was a near carbon copy of that shutout buster in Victoria in October. Evans around the net on a rebound, Halagian around the net after a dump in and regain control…all greasy, all hard work. That’s where the difference was tonight. 3rd period and Tristan Mullin got involved in the game. Perhaps I was unfair, saying that he was quiet, but in honesty he was. Perhaps it was just one of those games where he did a lot of things right but didn’t get noticed…that can often be a good thing. He turned it on in the 3rd though, sealing the victory. Tough for Jeff Smith. Probably should have 4-5 shutouts on the season, he’s certainly worked hard enough for them but just not meant to be. A breakdown in front spoiling that, but he’ll gladly take 31 saves and his 15th win of the season. With 15 wins from 23 appearences, Smith is on pace for a 37 win season. That of course assuming he plays as much as he has which I wouldn’t anticipate all the way through to the end of the year. 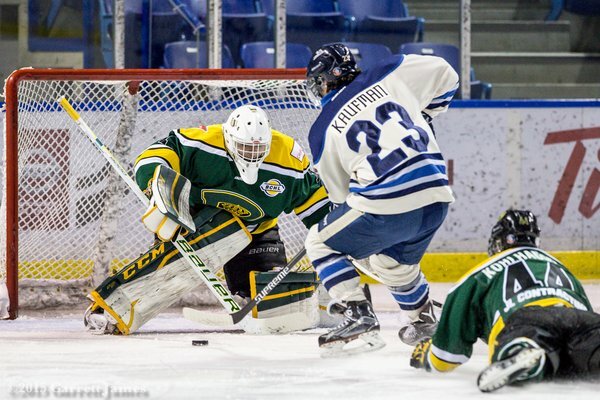 Regardless, Smith is on pace to better his 2013/2014 numbers where he posted a 20-10-1 record and won the BCHL Goaltender of the Year Award. He’s 6th in save percentage, 2nd in wins, 3rd in save percentage 3rd in shots against and 4th in minutes played. The Kings entertain the Grizzlies in the 2nd leg of the weekend double header on Sunday afternoon, a 2pm start at the Hap. 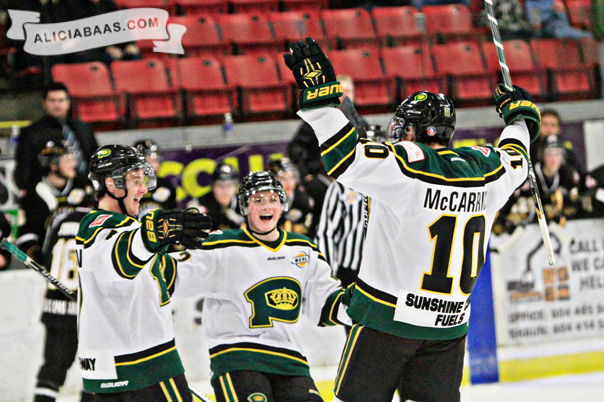 It took 5 games, but the Kings have their first points and first win as they took advantage of 6 chances on the powerplay, converting 4 times en route to a 6-1 victory over the Cowichan Valley Capitals on Friday night. Another game, another complete team effort when it comes from scoring. 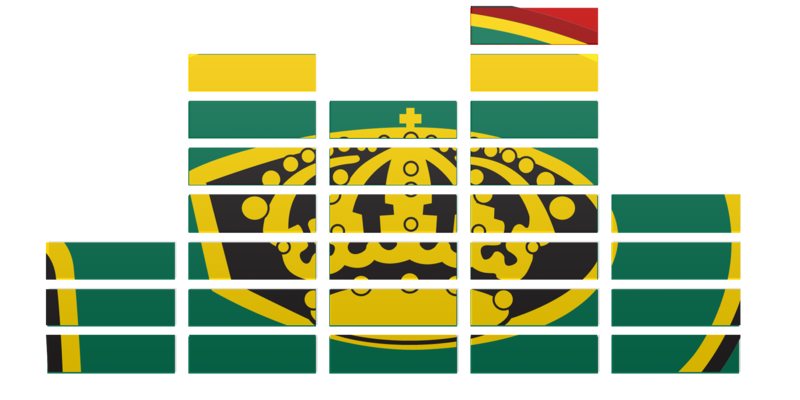 Merritt saw 6 goals from 5 players…Prince George was 7 goals from 6 players and tonight 6 different players chipped in 6 different goals. Also in on the act were a couple of unlikely sources with Colton Sandberg scoring his 1st and Andy Stevens his 3rd. On Colton Sandberg, he has a knack for hitting the big goals. 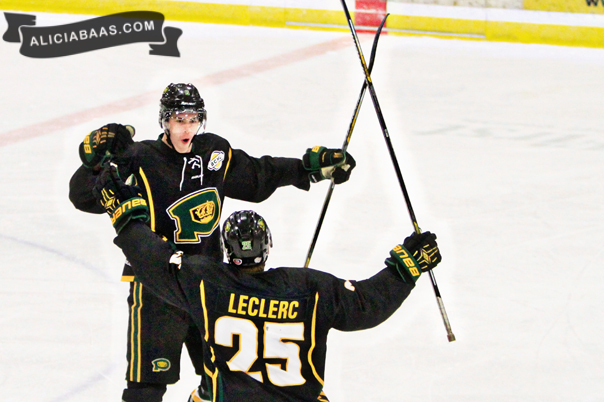 Two goals in the BCHL, both game winners. The 2nd one tonight and that goal against Victoria in game 6 overtime during last year’s playoffs. While we’re talking scoring, a couple of streaks continued tonight. Tristan Mullin notched an assist on Jonny Evans’ goal to continue his point streak, now at 6 games. Unfortunately his goal streak is snapped at 4. Curtis McCarrick now has points in 5 straight games with his goal tonight. Also Carter Turnbull moves to a 4-game point streak with a pair of assists. Look at the goals the Kings scored tonight. 3 from the blue line from shots with traffic in front of the net. Sandberg, Stevens and LeClerc all through good screens and making life difficult for Storm Phaneuf, and eventually Lane Michasiw. The others for Halagian and McCarrick were greasy, messy, 12-18 inches from the net. Jonny Evans’ was the only “nice” goal scorers goal. That’s the way the Kings play, will over skill, greasy and mucky around the net. When they’ve had success they’ve owned the boards and the slot. When they lose those battles, they typically lose the game. The key word tonight was discipline. We talked about it from a Kings perspective with Kent Lewis in the pre-game show, saying it was a point of pride that the Kings have largely played the right way outside of a stretch in October. We talked about it with Bob Beatty and how he feels about his team leading the league. We talked about it with Jeff Sargeant in the 2nd intermission and it continued to be the talking point into the post-game show. To add to that, quite simply, the Caps showed an undisciplined streak tonight and the Kings took advantage. Into the 3rd period, the game was still very much in the balance, the Caps Kade Kehoe took a 4-minute spearing call to really set things back. That penalty was pretty much game set match as the Kings scored in both halves of it and blew the game wide open. Add on another on a 5-minute powerplay courtesy a fight and some minors that cancelled each other out and and the game was well out of reach. There was certain frustration from Cowichan’s bench on the calls, reaching a boiling point in the 3rd period with the situation on Rhett Wilcox. I can only imagine the frustration stemmed from Wilcox being assessed the 5 and Halagian only getting the double minor for roughing, which was offset by the original minor and the instigator call on Wilcox following a hit on Carter Turnbull. Is there an argument to be made for the Caps? Perhaps. Halagian and Wilcox certainly seemed to engage in a fight, but you go back to the genesis of the whole situation and a clumsy his on Turnbull which started the whole thing in motion. Also some frustration from the Kings tonight as well as they were on the receiving end of a few bad hits. Turnbull was one, Gavin Rauser was another and forced him from the game. I would not expect Rauser in the lineup for the next little bit as it was confirmed after the game that there is a concussion to some degree, and at minimum there’ll be a week off via protocol to ensure he’s ok.
Having said all that…tonight, the least penalised team in the league and the most penalised team in the league both game up 6 opportunities. The difference was the double minor on Kehoe and the 2 goals and the fact that Cowichan took themselves off two powerplays in the early going, giving us extended 4-on-4 sessions in regulation. Jeff Smith very good again tonight. Broken record, but very good. A quiet beginning with the Kings dominating the 1st, with the first shot coming midway through on a 2-on-1 shorthanded break with Ayden MacDonald. The one that beats him, a bad break from a turnover in the Kings zone that eventually pinballs off some legs and trickles over the goal line. In talking with Nick Nonis who was the d-man on the play, he was pretty up beat about the game…things happen…but did note that he’s keen to make that up to Smith and there might be a lunch in the future heading the netminders way from Nonis. The win pulls the Kings within 1 point of Cowichan for 2nd in the Island Division, with the Kings also holding a game in hand. The Nanaimo Clippers won tonight so it puts 1st in the Division out of reach for this weekend, however the Kings hold 2 games in hand over the Clippers and are currently 4 points back. 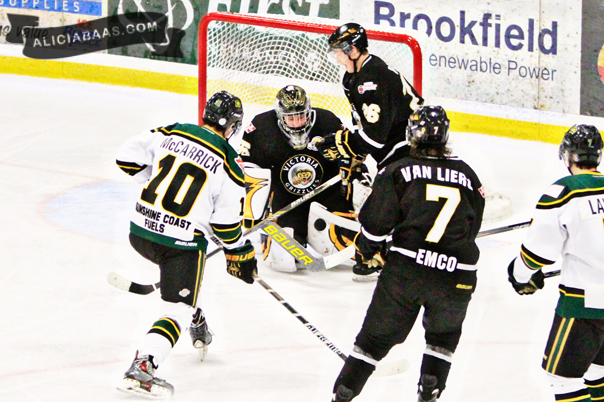 The Kings host the Cowichan Valley Capitals in leg 2 of the double header, 5pm Saturday at the Hap Parker Arena. 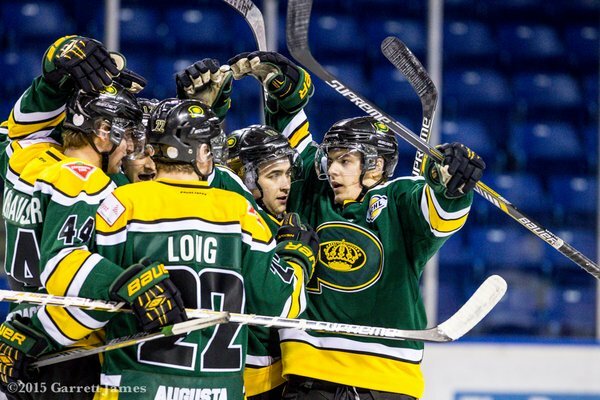 The Kings rounded out one of their toughest road trips of the season with a convincing 3rd period and a 7-3 win over Prince George, helping the team earn 5 of 6 on the weekend. A great end to a near-perfect weekend for Powell River through Chilliwack, Merritt and Prince George. One thing we really highlighted following the first two games were the 3rd periods. In Chilliwack it was a slip up of just a moment but it arguably cost the Kings 2 points and in hindsight a perfect trio of games. In Merritt, it allowed the Cents back into the contest. But in Prince George, there was no such slip. Shots were 22-9 in the 3rd period in favour of the Kings, nearly doubling their totals from the opening 40 (7 and 8 respectively). A bit of a slow start from both clubs. You would have expected the Spruce Kings to have a bit better of a jump having come off a big win the night prior against Salmon Arm. You could maybe anticipate some bus legs from a Powell River unit that was short on rest and long on bus miles. 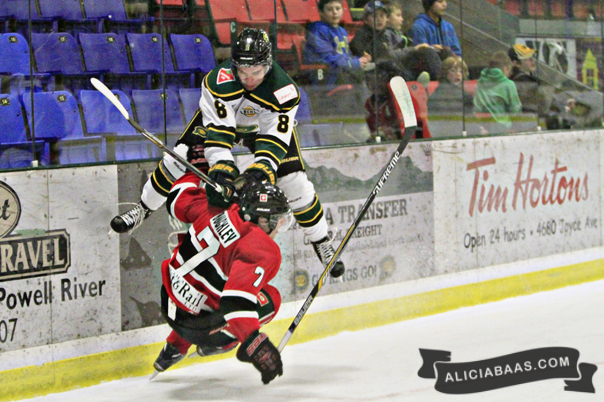 The 2nd period really was a carbon copy of the 2nd period between these two teams in Powell River…the only difference was a 2-0 Kings lead through 20. The Spruce Kings came out, scored early and eventually added a 2nd to draw the game level, then Powell River quickly responded to retake a 2-goal lead. 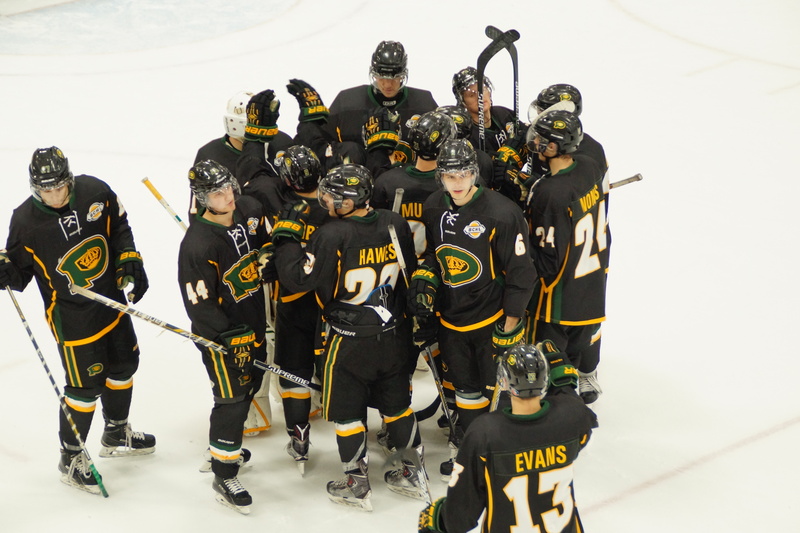 In Prince George, with a tie game through 20, back to back Spruce King goals were quickly snuffed out by Tristan Mullin and Jonny Evans. On Tristan Mullin, a very productive weekend for him with goals in all 3 games and he’s currently on a 4-game streak. And the black jerseys finally break their hoodoo and get a win. Now 1-2 in the alternates. Powell River moves to 14-10-0-1 and is 3rd in the Island Division behind both Cowichan and Nanaimo, with games in hand on the Clippers. It sets up a massive weekend this Friday and Saturday at the Hap as the Kings kick off a 6-game home stand hosting the Capitals in a pair of 4-point games.